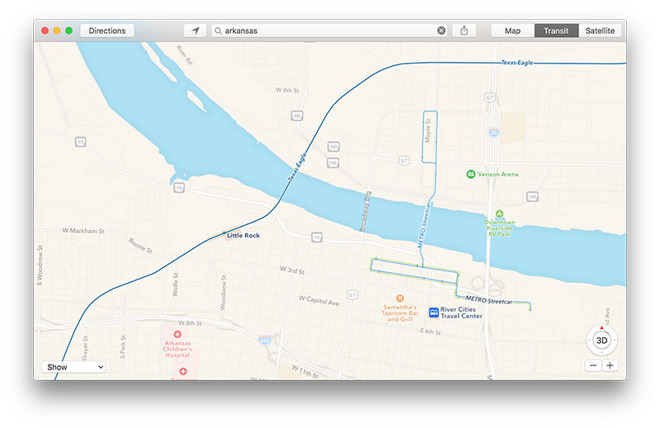 Apple recently activated public transit directions in major metropolitan areas of Arkansas, including Little Rock and Jonesboro, further building out the Apple Maps feature for users in the U.S. The new addition has not yet been recognized on Apple's iOS Feature Availability website, though AppleInsider readers are reporting Transit features are indeed live. As seen in the screenshot above, users in Little Rock and other major cities now have access to local bus and streetcar information, including routes, locations and service advisories. Apple Maps is integrating with a number of local services including Rock Region Metro in Little Rock and Jet in Jonesboro. These services complement existing support for regional Amtrak lines. As with past Transit rollouts, residents and visitors to the area can use the information to plan trips and create routes using Apple Maps. Arrival and departure information is gleaned from first-party sources and subsequently integrated into Apple's mapping app for easy city navigation. Apple's Transit feature returned to iOS with the release of iOS 9, replacing what was removed when the company abandoned Google's mapping technology. Relying on its own assets powered by IP acquired through purchases like HopStop and Embark, Apple Maps Transit provides routes, departure times and other relevant data for buses, trains, ferries and other forms of public transportation. Unique to the app are top-down views of select underground subway and train stations. Apple is working to build out coverage after launching Transit with minimal support in the U.S. and China. Subsequent rollouts brought the UK and Japan into the fold. Last year, Apple delivered the service to Paris, Singapore, the Netherlands and Adelaide, Australia. News of the Arkansas activation comes on the heels of an identical start of services in Orlando, Fla., which was reported earlier today.